The international clinker trade represents a small fraction of world cement production, in the range of 70 million tpy, with an imported value of approximately US$4 billion, according to ITC. Most of this trade is done via waterways. Few cement plants are designed for export or with exports as one of their core markets. The large majority of producers target domestic customers and, eventually, some plants will redirect part of their production abroad, as a means of compensating for the periodic fluctuations of internal demand. The secondary nature of export markets helps to explain some of the usual difficulties that are found in clinker export operations and which will be reviewed in this article. There is an interesting geographic pattern in the international clinker trade, and two indicators can be used to show it. African yearly imports of clinker amount to 25% of the international clinker trade, although its consumption of cement only represents about 6% of global production. New plants are appearing in some countries at a rather quick pace, even though installed capacity is already exceeding domestic consumption. Indonesia, Algeria, and Nigeria, as with China in the past, have large potential for development. However, in the coming years they may suffer a glut of clinker production that will have to be exported. International ports are crucial for modern economies, as 90% of all trade is done by vessel. 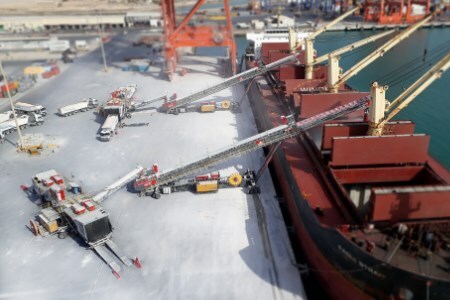 Yet ports are relatively scarce: in Algeria, for instance, it is estimated that less than 25% of the installed cement capacity is suitably located for exports, if the features of the nearest ports, plant capacity, and road transport are counted. Thus, few plants in Algeria have an advantageous option to compensate a weak domestic market with exports of significance. Because most factories focus on their domestic markets, export facilities are not designed to the performance standards that are usual in, for instance, the ore minerals industry. Loading a ship at a rate above 20 000 tpd is common for mineral ores, but this is practically unheard of in the cement industry. Clinker plants with private ports or dedicated terminals are not common, so public ports and general berths are used instead. Because of their economic importance, commercial ports are, or should be, busy with other products that create a steadier throughput. This compounds with the fact that clinker is seen as a ‘dirty’ product, which further reduces the available berths that port authorities allow to handle clinker. In a recent assessment conducted by Global Bulk Technologies (GlobBULK), less than half of the suitable berths handling bulk or general cargo were allowed to manipulate clinker. In this frame of factories without direct access to the water front, public ports, multi-user berths, and rapidly fluctuating exportable volumes of clinker, a specialised niche of machines has developed: the mobile clinker shiploader. In this article from the April issue of World Cement, Ricardo González of Global Bulk Technologies presents a guide to mobile clinker shiploaders. Read the full article here.